This roast chicken is so savory and satisfying. Add a simple salad and some wine, and you've got an easy dinner party for six in one pan. To make this whole meal gluten-free, use a good gluten-free flour blend (such as this one) to make the gravy. Happy cozy weekend to you. 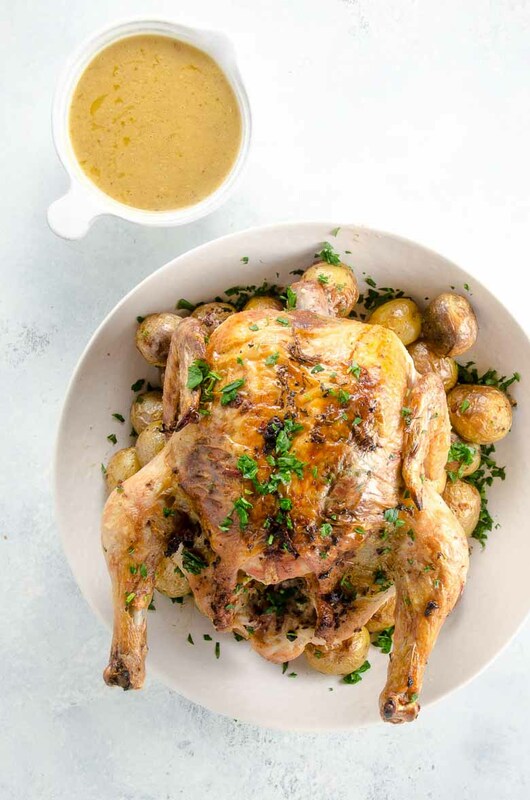 Once upon a time we used to make this juuuust slightly extra-special roast chicken and potatoes on a regular basis. Then I forgot about it for years. But recently a nice thing happened — more on the details some other time — and one morning I ended up promising our little Celia that I’d make “chicken with stars” for dinner.It was very sweet. We had a nice hug. But boy did I not know what chicken with stars meant. Neither did she.Celia went off to school, and I started thinking. This roast chicken with butter, prosciutto, lemon, thyme, sage, and full-on savory happiness is adapted from an old Jamie Oliver recipe. I’m not sure what brought it to mind again that day — maybe the fact that in my current aggressively post-vegetarian state I basically wrap every single thing in layers of prosciutto? — but I figured, hey, Jamie Oliver is a star, and so are most of the ingredients in this recipe. Gravy is certainly a star in my eyes. And that’s that.I highly recommend this easy recipe for a cozy dinner party of up to six people. Just add a simple salad and plenty of wine. And maybe a nice fire and some sultry jazz.Have a great weekend. Talk to you soon. Preheat oven to 425°F with a rack in the center. Choose a roasting pan that will accommodate the chicken and potatoes. (A good old 13" x 9" metal roasting pan that's on the deeper side and safe for the stovetop usually works well.) Place the chicken in the pan breast-side up and slide your fingers gently between the skin and the breast to make a pocket on each side. In a small bowl, mash together four tablespoons of the butter, the chopped prosciutto, garlic, sage, lemon zest and a few generous grinds of black pepper. Use your hands to spread most of the butter mixture between the skin and breast of the chicken, then rub the rest all over the outside of the bird. Tuck the thyme sprigs and lemon halves into the cavity of the chicken. Roast for 20 minutes. Meanwhile, bring a large pot of very well salted water to the boil, boil the potatoes for 10 minutes, and drain. Use tongs to lift up the chicken for a moment and add the parboiled potatoes to the bottom of the roasting pan. Roast for 40+ minutes more, until an instant thermometer inserted into the thickest part of the thigh (but not touching the bone) reads 165°F. Let chicken rest on carving board for 10 minutes and spoon potatoes into a serving bowl. Make the gravy while the chicken rests. In a small bowl, mash together the remaining two tablespoons butter with the flour to make a paste. Set roasting pan over medium-high heat on the stove (one or two burners, depending on the size of your pan). Whisk flour paste into pan drippings and let brown for a minute. Then whisk in wine and simmer for a minute or two. Pour in stock, whisk to remove any lumps, and simmer for about 8 minutes until nicely thickened. Taste for salt and grind in some black pepper. 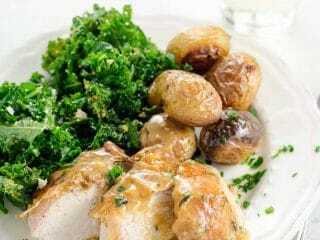 Carve chicken and serve with potatoes, gravy to pass at the table, and maybe a nice simple kale salad.